The music, first of all. Black Metal has always put attitude before music in its priority scale. We don't. Although we still (we always had and always will) have Black Metal as our path, we don't have the intention to adapt ourselves to the "scene" or such. E Trite Moira is going to stick straight along its initial idea until the end: playing magic, grim, extreme dark music the way E Trite Moira wants to; the rest is secondary. Then, the idea itself. We search what is hidden, we search what is lurking, growing like a cancer in mankind, poisoning its very essence. We search (y)our pain, we search (y)our darkest passion, (y)our most violent spasm and (y)our last breath just to praise them. We look for the black blood infecting your body, we are digging for the most merciless side of (y)our soul. What should be clearly stated is that the ultimate goal of this voyage is (y)our death. Delusional political fanatism, melancholic depressive whinings about the harshness of life have to do with life, not with Black Metal. Thus the name of the band "E Trite Moira", namely Atropos, our favourite representation of Death, found in Greek mythology, thus our cult for every negativity, every unseen, grim detail which hurts humanity in its human condition. 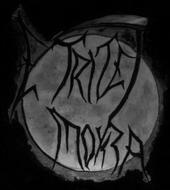 E Trite Moira were given birth by the inspiration of Ades (drums) and Nihil (guitars) to found a black metal band in late summer 2002. After having immediately contacted P.Deathwing (vocals), since the beginning responsible of lyrics and vocals, the band composed the first song, Tempus Lupi Veniat. After a short time, the bass player Nero joined in, and, after six months, the first Demo-CD, Tempus Lupi Veniat, containing 3 songs + intro & outro, was recorded. After two months, while the band was composing new tracks, Nero decided to leave, and was replaced by Draconian, excellent bass player who immediately felt himself totally involved in the spirit and work of the band. After the arrival of 2nd guitarist Laarin, after hard months of preparation, E Trite Moira had their first live date (with Hellstorm from Milan) in July 2003. E Trite Moira changed a lot as Laarin and Nihil decided to leave forever. The band was unable to find guitarists in the area, so, P.Deathwing began playing guitar while continuing as vocalist. After three months of unending hard work and exercise, Draconian, for personal reasons, left the band, too. Being strong and enduring, P.Deathwing and Ades recorded the new Promo-CD Maledizione del Cristianesimo in March 2004, with an auxiliary bass players help: 4 totally new tracks actually available. Some time later, Jackal 6:96 joined E Trite Moira as a stable bass player. Some of the work of the band began almost from scratch; most bass parts were rearranged, and E Trite Moira's sound reached its actual form. At this time, E Trite Moira, after having found in the members of the Death/Black Metal band called "Unholy Land" a great live support (Jackal isn't in the band anymore), will start to spread their curse once again: rehearsals have started and the band is preparing for live shows which will take place this winter. Further information will be available here in the near future. E Trite Moira are mostly inspired by Norwegian bands such as Darkthrone, Taake, Burzum, Ulver, Mayhem but Swedish influences from bands such as early Marduk, Dissection, Dark Funeral, Bathory also are excellent weapons for their expression.